There are various Boards and Commissions containing members of the community who are appointed by the Board of Supervisors to serve the West Mead Township residents and community members. The West Mead Township Board of Auditors meets on the first day of the year after the Supervisors Reorganization Meeting. They then meet for numerous weeks during the first part of each year to review and audit the Township financial records. The West Mead Township Zoning Hearing Board meets on the third Wednesday of each month, if there is business to conduct. They conduct zoning hearings such as Variance and Special Exception applications from the restrictions of the Zoning Ordinance. The West Mead Township Planning Commission meets on the last Thursday of each month, if there is business to conduct. They review conditional use applications, land developments, subdivision plans and work on updates to the West Mead Township Comprehensive Plan, Zoning Ordinance and Subdivision and Land Development Ordinance. The West Mead Township Code Appeals Board meets on whenever necessary. They review appeals from the PA Uniform Construction Codes at the request of contractors or property owners relating to building code restrictions and requirements. The Meadville Area Recreation Authority Board meets on the third Friday of each month, at the Meadville Area Recreation Complex. West Mead Township representatives serve with other members from the City of Meadville and Vernon Township to oversee the management of the facility and recreation opportunities. The Meadville Area Sewer Authority Board meets on the third Tuesday of each month, at the Meadville Area Sewer Authority building. 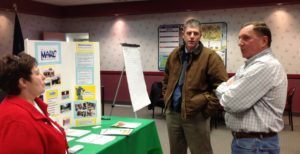 West Mead Township representatives serve with other members from the City of Meadville to oversee the management of the regional sewer facilities.